I’m not sure, but it looks like you might have just overlooked it. stangs-dbyal is the usual pair in Old Tibetan inscriptions, etc., but you also find it in Bon scriptures quite often, too. Sometimes it looks like yin-yang (or rather, yang-yin). I think R.A. Stein discussed it. And Googlebooks took me to p. 35 of H. Richardson’s Corpus of Early Tibetan Inscriptions (1985), which apparently cites this very piece (Cuevas also did something with it in his book Hidden History of the Tibetan Book of the Dead, p. 224, note 36, although it looks like he must be following Haarh here [he cites Haarh p. 405]… He takes the dbyal to mean something like ‘withdrawn,’ which is surely not correct!). I’m guessing the btsan po rje dbyal ought to be translated as three separate things: 1. Emperor. 2. lord. 3. lady. Whenever any one of those three happened to get nongs-ed, then the following would apply (the repetitive form of the nam zhar looks like it could be a use of repetition with distributive meaning…. ‘Whenever any one or another of these’). There is a lot more to discuss in this. Like I wonder if the mtshal really means ‘vermillion’ here, or is it just a word for ‘blood.’ You find sku-mtshal on a following line of the OT document, where it is evidently just supposed to be a word for the high-class corpse. But in later times it seems sometimes to be an honorific meaning simply ‘blood’ (in context of relic listings). What exact useful effect would smearing vermillion have on the corpse, anyway? (Besides of course to make it red, which I suppose could be enough.) Just thinking aloud. It’s still amazing that Haarh was able to work up the confidence to translate it at all. Not at all surprising that there are some problems with his translation. And speaking of funerary rites, have you had a chance to have a look at the last part of John Bellezza’s latest book? I haven’t. Happy Halloween. Dan, thanks for kicking the (Hallowe’en) ball straight back. Or should that be a pumpkin? Yes, I glossed over rje dbyal. It could well be, as you say, three kinds of people, tsenpos, lords and ladies. But, seeing as the passage refers specifically to the body of the tsenpo, it doesn’t seem to be describing an all-purpose funeral for any royalty. Perhaps it could be the tsenpo male and female pair: i.e. the tsenpo and his queen(s). This *seems* to be the usual use of stang(s) dbyal (a quick and unscientific assessment made purely from Googling the term just now). There are references in the Annals to funeral rituals for other members of the royal family. Could bstan po ever refer to other royalty? I’d never previously thought that it could. As for tshal, I think this came up in those “Red-faced men” posts. If it’s the mourners having their faces painted (and not the corpse) as I argued here, this suggests that funerals were one of the circumstances in which the red face painting that gave the early Tibetans their nickname was practised. I suppose it could have been blood, given that they were lacerating themselves as part of the process. If it was vermillion or another red dye, surely it was meant to represent blood anyway? I have much admiration for Haarh, and Bellezza too. I hope to see that new book sometime soon. I think there’s still some missing key to understanding here, not that I can put my finger on it. Our wise woman speaketh in riddles it doth seem! And no man understandeth her. Where’s our man Brandon? Do you have any idea at all what the syllable lom might mean? Could we connect the dots to make it out as chom or some form of ‘dzom? This syllable lom doesn’t occur once in the entire text of that huge dictionary Rgya bod tshig mdzod chen mo. The Btsan-lha dictionary (Brda dkrol gser gyi me long) has it at least twice, although hidden inside these entries where it is preceded by a negation: bu mo ma lom, & ma lom. And you can find a couple of instances in OTDO (http://otdo.aa.tufs.ac.jp/). I don’t know if any of this helps the least bit, but no one should say I haven’t tried. Happy Diwali, in any case. Sorry it took me a full month to see that I’ve been called out, but unfortunately my reappearance will do little to resolve these problems. Still, it is nice to have a crack at this passage, which purports to be the charter myth for early Tibetan funeral traditions. Third, I have no solution for the alternation between honorifics and non-honorifics here. and the lord emperor die, bind a vphren·mo top-knot, rub the face with vermillion, lay down the body, pierce the corpse of the emperor, expel the men, eat food, drink. Will [you] do like this or not do [like this]? I like your and Nathan’s solution: either “an emperor, lord, or consort,” or “an emperor or consort.” And it seems we certainly must accept the possibility that neither verb means ‘to pierce’. Since you and Dan both read the mysterious syllable as chom, I’m happy to accept that. But please consider my solution for the alteration between non-honorifics and honorifics: that the words thor to ‘phren mo ni bcings / ngo la mtshal gyis byugs / lus la ni bzhags refer to the actions performed on the hair, face and body of the mourner, while the words btsan po ‘i spur la nI ‘tshog (and perhaps those following) refer to action performed on the body of the tsenpo. My translation takes bzhags as the past of vjog, but according to Zhang (1985) the word bzhags can also mean ‘to decorate, beautiful.’ Wang and Bsod nams skyid give « lus povi thog la thig btag [annoint the body] » (1988: 37 n. 143 on p. 80). Gnyav gong dkon mchog tshes brtan gives « lus la ni mdzes par brgy[beautifullly ornament the body] » (19 n. 19 on p. 22 where it is given as n. 20 ). This interpretation – “decorate/annoint/ornament the body” – works perfectly well if the body in question is that of the mourner. It could refer to the wearing of actual ornament (jewels etc) or further decoration with the red substance we are calling vermillion. This latter interpretation is attractive to me because it suggests a substitution in Tibet of red face-and-body-painting for the laceration of the face and body found in so many other Inner Asian cultures. So I still think this solution is a good one, but feel free to convince me otherwise! No, I don’t think I want to convince you otherwise. Your solution is the only one that copes with the non-honorifics here. On bzhags, though, I will say that I was also struck by its possible meaning as “ornamenting the body,” but I’m more comfortable with reading it as the perfect stem of gshog “to split”. This self-flagellation would also seem to fit better with the context you’ve outlined. As for ‘tshog, perhaps it means “to assemble at the corpse.” Otherwise, it may come from the verb ‘tshag, meaning “to save or accumulate”. Or, if you look at it through Buddhist-tinted glasses, one could read tshogs into this, which might fit with the robbing, eating and drinking by the assembled hordes! Your reading of lom is better than chom, bcom (or phom), however, there must have been a superscript r. The cluster rl- (and not the mere radical l) looks exactly like this (except for the white gap) in all other instance. See my note 42 in the translation indicated by the url. There a many convergences in your and my translation, and I wish I had seen yours earlier. @Brandon: I really wonder if a verb that is used for chopping wood can also be used for flagellation. 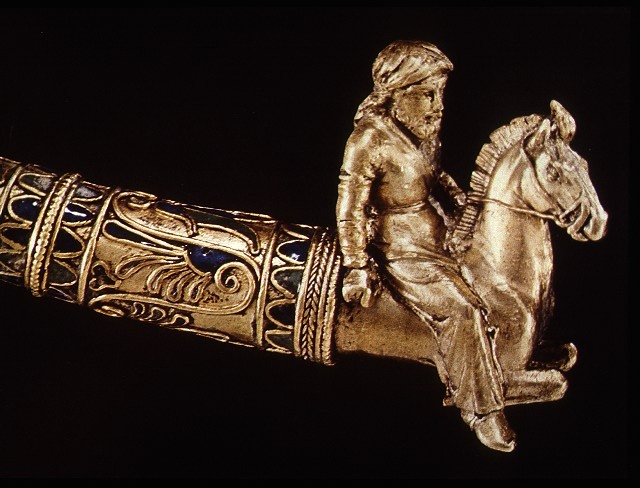 I would thus opt for adornement, but since the Scythian context is already given, what about tatoos?